"Change is hard at the beginning, messy in the middle but gorgeous at the end," Bureau of Soils and Water Management (BSWM) OIC, Director Sonia M. Salguero quoted Robin Sharma during the technical briefing on "National Soil Sampling and Testing for Fertility and Crop Suitability Assessment " held at the Department of Agriculture Regional Field Office XI (DA-RFO XI) on August 10, 2016. In the course of the meeting, the BSWM discussed the project protocol in the conduct of simultaneous field survey and data processing. The outline includes procedures for sampling, testing, survey and mapping; institutional arrangements; terms of reference of Project Staff; and composition, roles and responsibilities of regional field teams. Moreover, the BSWM urges the DA-RFO XI to use a template survey form where selected farmers shall be interviewed to determine the farming practices in the area particularly on the crops and varieties cultivated, the fertilizer usage and other relevant information. DA OIC, Regional Executive Director Ricardo M. Oñate, Jr., on the other hand, manifested his support by way of offering assistance to the BSWM on accommodation and vehicle support to the team during their field activity for the period of 22 days starting August 10. Dir. Oñate also underscored that the implementation of the said activity is highly acknowledged as it will help boost and improve farmers’ productivity in Davao region. "Nagpapasalamat ako na maganda ang ating partnership. 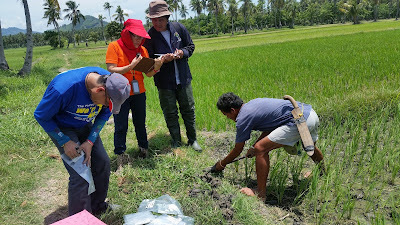 And definitely we would like na matapos po sana ang soil sampling activities dito sa aming area before the end of this month," Oñate said during the technical briefing with the BSWM.